pick their own navy blue skirt and white tank top. 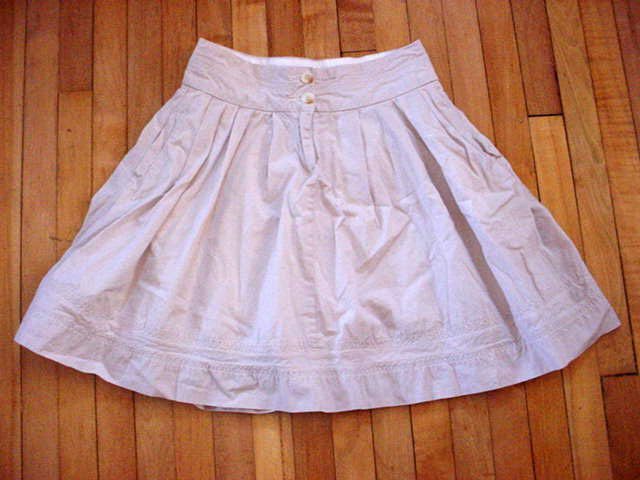 After breathing a sigh of relief that I wouldn’t have to wear some poofy bridal shop confection, I hit the thrift stores in pursuit of the perfect skirt. And I found one rather quickly, except it was the wrong color. Rats! I decided to try it on anyway – it fit perfectly and was only a quarter, so I decided to buy it and redye it to the color that I needed. Surely khaki would be easy enough to dye. A quick trip to Walmart netted me a box of navy dye for around two bucks. After reviewing all of the dying options, I decided the washing machine-method sounded like the way to go. I filled the machine with hot water, and added the dye and the cup of salt that was recommended for cotton. 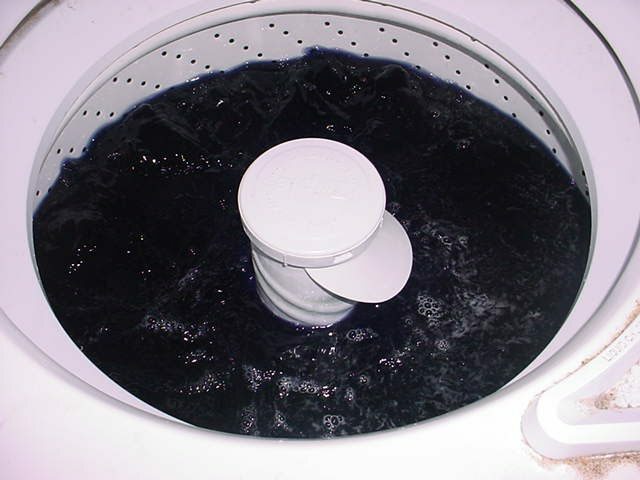 Then, I rinsed the skirt in hot water, added it to the washer, and let it soak for thirty minutes. 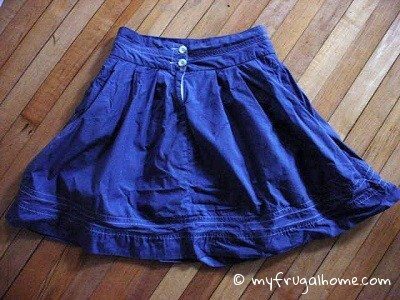 After rinsing the skirt, and running it through the dryer, I had my navy skirt, and it was even better than I expected. See the white stitching? Apparently the skirt was put together with a synthetic thread, so it didn’t get dyed blue. I love how the stitches stands out against the blue. And the buttons kept their original color, too. I now have the perfect skirt for my sister’s wedding, and it only cost me around $2.25. Thrift stores come through again! 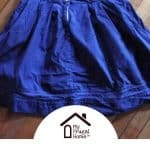 Want to try your hand at redying clothes? Save money by reworking second-hand finds, as I did; or rework things that you already own. Redying is a great way to cover up stains or to revitalize outfits that you’ve grown tired of. Wonderful. 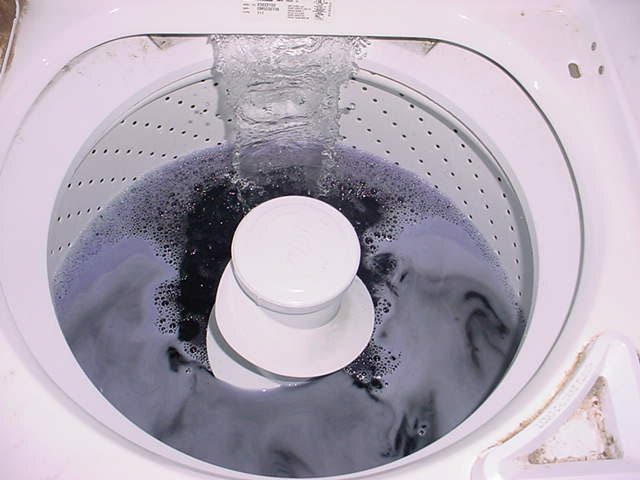 So I have to ask….how did your washer look after the dye? I have always wanted to do this but did not want to create a situation where everything will be that color for the next 2-3 washes? Thanks for tip! The instructions on the dye box recommended running the washer through a full cycle with hot water and a cup of bleach. I did that, and you couldn’t even tell I had used it to dye something. We’ve since done several loads of laundry, and haven’t had any problems. We use to do this all the time growing up. Something got a stain that couldnt get out or jeans fading. Dont know why I stopped. Havent dyed anything since college. I too am about to do this because a red shirt got into the light color laundry and there are some guy shirts dyed pink accidentally now. We’re thinking to do them navy or dark green. 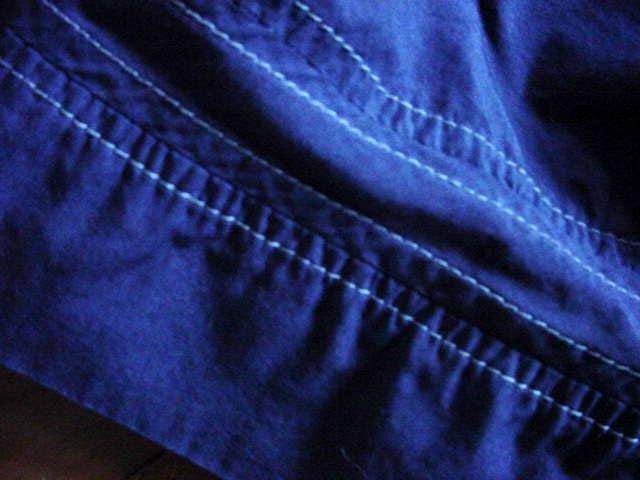 That navy looks awfully blue… maybe I’ll try for an indigo or dark blue. I am concerned though, that the color will bleed in the next wash… will the item be color fast in warm water? Or do I have to go with cold water for home dyed clothes? Thanks. Hi Anna, I haven’t had any trouble with things that I’ve dyed bleeding onto other clothing in the wash, but I do wash them alone the first time, just in case. 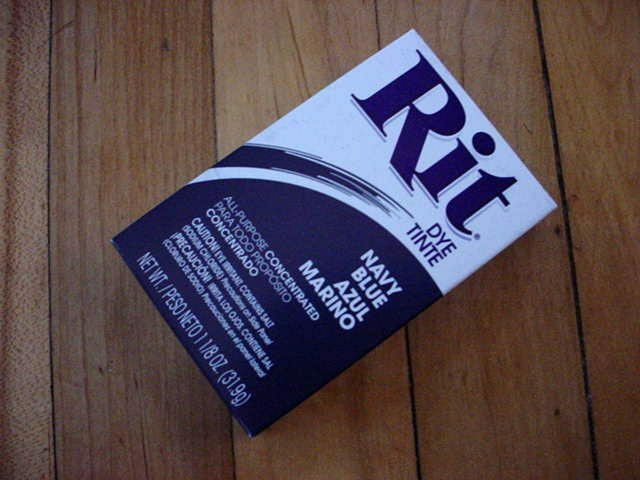 If you’re worried about it, Rit sells a Dye Fixative that’s supposed to prevent cotton clothing from bleeding. They also sell a product called Color Remover that you may be able to use to restore the shirts to their former non-pink color. It’s not something I’ve tried yet, but now that my daughters do some of the laundry, I’m sure it won’t be long before I get my chance 🙂 Whichever way you decide to go, I’d recommend following the instructions on Rit’s website. They’re a lot more detailed than what comes on the box or bottle. https://www.ritstudio.com/ Good luck with your dye project!